Millie's final resting place would have been a dumpster in San Antonio, Texas, if someone hadn't found her in the nick of time and called for help. 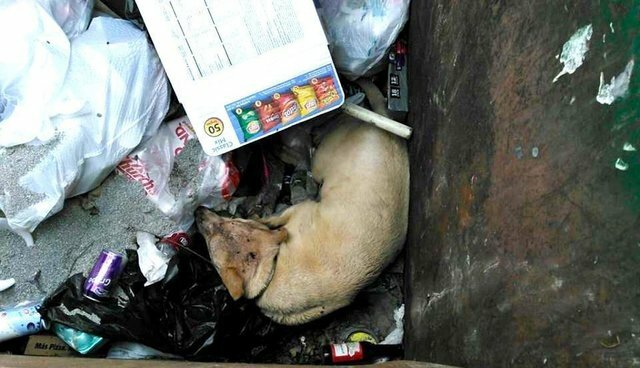 If she had been left in the dumpster for another hour longer, she may have died, Audra Houghton, field operations supervisor for San Antonio Animal Care Services (ACS), told local news outlet KSAT 12. Suffering from heat stroke, the yellow Lab didn't have the energy to move. She could only find comfort from the elements under piles of garbage and boxes of pizza, according to her Facebook page. But someone saw her lying there, abandoned and alone, covered in flies and maggot eggs - and immediately took her to get help. ACS labeled Millie's case as a "horrifying discovery." "We don't know how long she had been in there before that call came in," Matt Llewellyn, ACS Clinic Manager, told told KSAT 12. With a combination of robust medical care and a loving foster home provided by the volunteer group Lucky Lab Rescue and Adoption, Millie, who is estimated to be 9 or 10 years old, went from living in a hopeless situation to becoming the poster pup for miracles. Her transformation into a happy, healthy dog has truly been stunning - and about two months from now, once she's cleared of her heartworm, Millie will be gearing up to find the perfect forever home. Officials from ACS are still investigating Millie's case to see if anyone has information on how Millie made it into a dumpster in the first place. She was reportedly found without a collar or microchip, but the ACS believes that she may have had an owner because she is housebroken and crate-trained. You can keep up with Millie's progress on Facebook.